Rain, snow and cold dominated the forecast in Detroit last week, but Dutch adventurer Wim "The Iceman" Hof likely didn't care. Hof, who lives in Amsterdam, holds multiple records for endurance, resilience and respiratory control, including withstanding extreme temperatures with minimal protection. He is known as "The Iceman" for his demonstrated prolonged exposure to ice baths in experimentally-controlled settings. "I believe in what I do. I want science to put it to the test," he said in an interview at the Wayne State University School of Medicine's Tolan Park medical office building. "It's not about me. I'm just a case study indicating how this thing works." The "thing" is his astounding ability to exercise conscious control of his body's autonomous system, based on a combination of breathing and meditative techniques that allow him to voluntarily alter his physiology to adapt to environmental stress. His physiology - and how his techniques have increased anti-inflammatory mediators in trained volunteers - has been extensively studied, but WSU scientists this week were the first to record and analyze what's going on in his brain when he does it. Hof visited Detroit and the School of Medicine Feb. 6-8 to work with Otto Muzik, Ph.D., professor of Pediatrics, Radiology and Neurology, and Vaibhav Diwadkar, Ph.D., professor of Psychiatry and Behavioral Neurosciences, and co-director of the Brain Imaging Research Division. Hof is collaborating with the scientists on functional magnetic resonance imaging and positron emission tomography studies of thermoregulatory defense. Drs. Muzik and Diwadkar are already conducting fundamentally groundbreaking research on how the human brain responds to changes in body temperature, particularly changes following cold exposure. Their study on, "In vivo correlates of thermoregulatory defense in humans: Temporal course of sub-cortical and cortical responses assessed with fMRI," was recently published in the journal Human Brain Mapping. "During his visit, we scanned his brain and body while he underwent experimentally-controlled cold exposure," Dr. Muzik said. "These are the first known studies on the brain of an individual recognized for extreme cold tolerance. 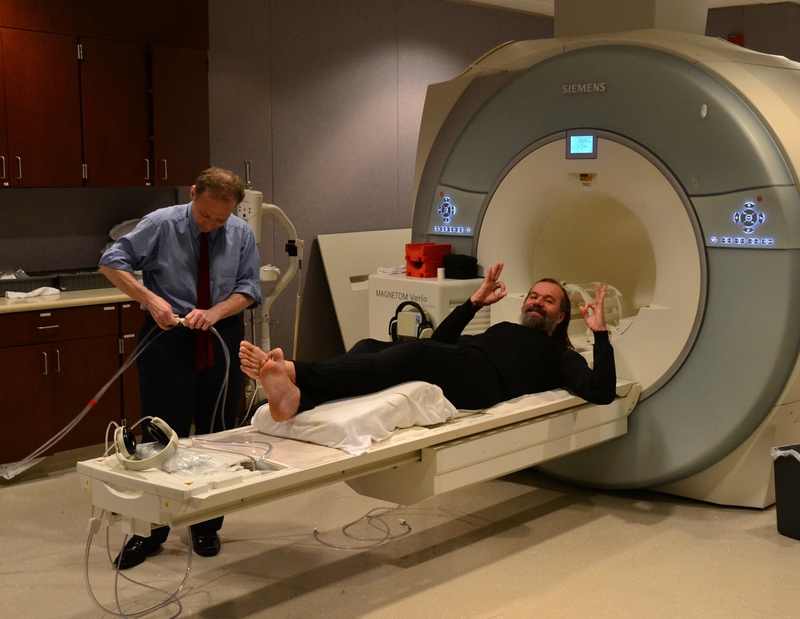 While Wim's physiology has been studied by other researchers in the Netherlands and Germany, he has never been studied with brain imaging, and has chosen to do so with us at Wayne State University. It is also notable that Wim's abilities extend beyond simple cold tolerance, as there is evidence suggesting his method has ancillary positive effects for the body's immune system." Hof wore a water perfusion suit, which continuously pumps ice cold water in and out of tubes in the suit, while lying in fMRI and PET machines. They also monitored his heart and metabolic rates. "I was heating the water at first," he said. His abilities have been documented by media outlets throughout the world for years, but only in the last few has he pondered how it could be explored for fighting disease, depression and stress through long-term medical studies. "The potential is enormous. I have no medical background, but I can work with them. I have 40 years of field experience. I can bring it to the laboratory setting," Hof said. "You can use the autonomous nervous system to fight disease. We can tackle it. We, as a scalpel, can go into our own brain and neutralize what's going on." He wants to return to WSU in the future to continue the studies. "I just want this to be proven beyond speculation, because it is there. The solution is there. We just need to prove them in science," he said. "What I can do, anybody can do. We will not become sick. We will not suffer from depression." Hof also presented a free lecture "On the Conscious Control of the Body's Autonomous Systems" Feb. 8 to a packed audience at the Margherio Family Conference Center, where students, faculty, staff and outside guests filled nearly every seat available, and plenty of floor space as well. For more information on Hof, visit www.wimhofmethod.com.